Crop circles are primarily a modern phenomenon and in many cases, they've been explained as hoaxes created by tricksters out for a bit of fun. Certainly, some crop circles are confirmed manmade hoaxes. However, others remain unexplained, leading to the question if some crop circles are hoaxes, are they all hoaxes? Crop circles are flattened patterned areas that appear in the crops, often circular in nature. In most crop circle cases, the stalks of the plants are bent but not broken, and the patterns may be simple or highly complex. What Are Orange Light UFOs? In many cases, hoaxers have claimed their work, describing how they made crop circles overnight. The earliest example of these hoaxes comes from two men many consider the godfathers of the crop circle phenomenon, Doug Bower and Dave Chorley. In the 1990s, Bower and Chorley claimed they created crop circles in England starting in the 1970s using a board on a rope to flatten crops. According to the two men, they continued to do so for years, and one of their early circles was so widely publicized it caused others to copy their work all over the world. Since then, many hoaxers have claimed crop circles as their works of art, stamped into fields of wheat, rye, barley, corn, and canola. However, many crop circles remain unclaimed, and some have startling complexity. 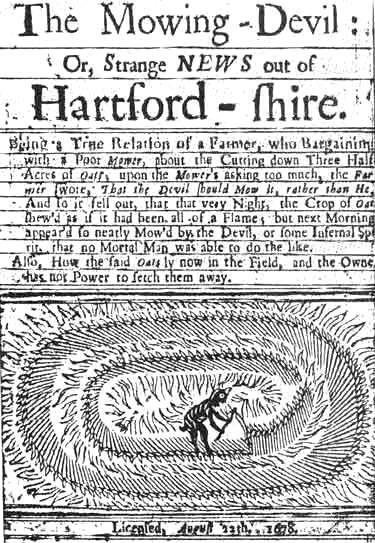 In the 1600s, an English oat farmer was feuding with a worker, and he told the worker he'd rather pay the Devil to cut his field than pay the worker. A woodcut from the time shows the field of stalks in a circle with devil cutting it with a scythe. It is unknown if this is folklore, but some believe it is evidence of a very early crop circle. Most reports of crop circles are relatively modern phenomena, coming from the 20th and 21st Centuries. However, a few reports from the 1600s to the 1800s suggestive of crop circles, mostly simple flattened patches of normally standing crops occurring in simple shapes. No photographs exist to document these reports, so it is unknown if they are merely folklore or something with simple, natural explanations. One of the earliest 20th century reports of crop circles on record occurred in Charlton, Wiltshire, UK. In July of that year, a farmer named Roy Blanchard discovered a roundish crater on his farm, sparking national interest in what could have caused it. Fearing it was made by UFOs, the army came with bomb disposal equipment, but nothing was found and the crater remained unexplained. However, British astronomer Patrick Moore also came, curious about the crater, and in August of that year he wrote a letter to New Scientist magazine describing several elliptical areas of "spiral flattening" that occurred at the same time is the crater in a nearby wheat field. The Tully saucer nest occurred in 1966 in Tully, Queensland, Australia. A local farmer named George Pedley was driving his tractor on a neighboring tract of land when he claimed he saw a flying saucer rise from a swamp near a lagoon and fly away. It left behind a flattened circle of swirled reeds that was about 30 feet in diameter. Later, interested onlookers noted two additional flattened "nests" that were smaller than the original, one swirled clockwise and one swirled counterclockwise. Later, another onlooker found an additional nest with a scorched center. Interestingly, this is the case that Bower and Chorley were trying to re-create with their later UK crop circle hoaxes. A wheat field near the Chilbolton Observatory in Chilbolton, Stockbridge, UK is the site to a series of fascinating crop circles possibly related to a message beamed into space from the Arecibo Radio Telescope in Puerto Rico in 1974. The broadcast beamed information about Earth and humanity into deep space to star cluster M13, 21,000 light years from the Milky Way. It contained binary code creating pictorial representations of things such as numbers 0 to 10, atomic numbers of the elements that make up DNA, a human figure, a depiction of the solar system, and several other pieces of information. In 2001, a crop circle appeared in a wheat field adjacent to the Chilbolton Observatory that appeared to be a response to the Arecibo message. It was formed exactly as the Arecibo message had been with a few key changes including the depiction of the solar system, the DNA structure, the representation of the "human" like figure, and some other details. In 2002, a crop circle of an alien face with a binary code disc appeared in a wheat field in Crabwood, Winchester, UK. The image of the alien looked very much like how aliens are depicted in movies and descriptions of alien abductions. The binary message, when decoded, read, ""Beware the bearers of false gifts and their broken promises. Much pain but still time. (Damaged word). There is good out there. We oppose deception. Conduit closing (bell sound)." In 2008, an intricate and mathematically precise crop circle appeared in a field of barley near Barbury Castle in Wiltshire, UK. It was discovered on June 1 and quickly drew international interest as the most complex and intricate crop circle that had ever appeared in England. A retired astrophysicist named Mike Reed saw an image of the crop circle and realized it was a depiction of pi rounded to the 10th digit. 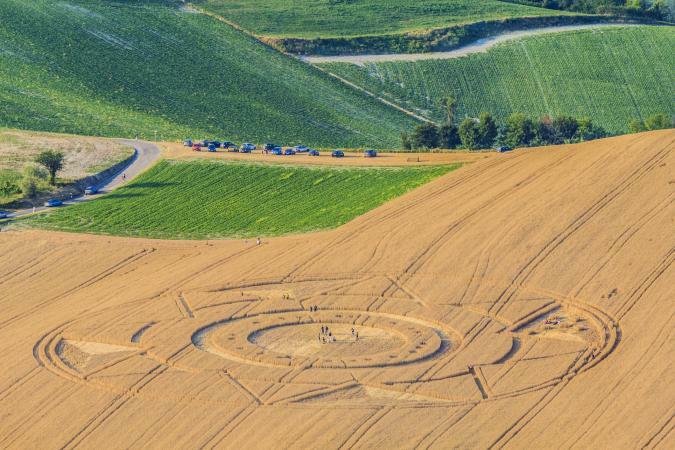 No one has claimed responsibility for the 150-foot crop circle. While many crop circles have been proven hoaxes created by humans, their increasing numbers, precision, sizes, and complexity keep many wondering. Are crop circles messages from aliens, communication from the planet, or something else altogether? The answers remain largely unknown, but they are a fascinating phenomenon.